On Friday, three days after his team acquired Kyrie Irving, Boston Celtics head coach Brad Stevens stood inside the Naismith Memorial Basketball Hall of Fame still trying to emotionally process a league-rocking swap of All-Star point guards with Boston's primary rival. For all his excitement about what lies ahead with Irving, Stevens wanted to first laud what Isaiah Thomas and Jae Crowder meant in pushing Boston to the brink of title contention. A young Celtics fan had put Stevens on the spot in a question-and-answer session by asking him why he traded the beloved Thomas, and the coach -- the father of two young children -- likely repeated an explanation about how brutal the business of basketball can be. As if the process of moving on wasn't difficult enough already, the Cleveland Cavaliers were about to throw the trade into a maddening limbo after expressing concerns about Thomas' hip following his post-trade physical. It would be five more excruciating days before the Celtics agreed Wednesday night to deliver a 2020 second-round pick (via the Miami Heat) to officially complete the swap. With that, the Band-Aid could finally be ripped off. Celtics fans woke up to the reality that, a little more than four years after a languid press conference to introduce MarShon Brooks, Keith Bogans, and Kris Humphries, the Celtics will open training camp next month by sending Irving, Gordon Hayward, and Al Horford to their dais. How will Boston's new Big Three work together? The Celtics won an East-best 53 games last season before bowing to the Cavaliers in the conference finals. Celtics president of basketball operations Danny Ainge celebrated by bringing in 11 new faces. Only four players return -- Horford, Marcus Smart, Jaylen Brown, and Terry Rozier -- and the Celtics must replace four starters. There are intriguing new toys for Stevens to play with, especially Irving and Hayward, but also No. 3 pick Jayson Tatum. The development of Brown, the No. 3 pick in the 2016 draft, may even be key in Boston's success this season. When asked if seeing so many new faces was exciting or overwhelming, Stevens didn't make a choice. "The biggest thing is there's a lot of unknown," said Stevens. "We all know what Horford is capable of, what Gordon is capable of, what Kyrie is capable of. At the same time, there's a lot of unknown with the rest of our roster, from a youth standpoint, because some of those guys haven't even played an NBA game. "We'll see how much they impact winning. We have no idea right now until they play a game." Stevens seems to recognize that Irving, Hayward, and Horford are so talented and have such complementary skill sets that Boston's stars will figure things out on the fly. That's not to say this will be the 2007-08 Celtics all over again when Paul Pierce, Ray Allen and Kevin Garnett hit the ground running en route to the team's 17th championship. Stevens' biggest challenge here might be figuring out how everything works around those three. Should Marcus Morris start up front next to Horford? Is Brown, Smart or Rozier the best the option at the 2 guard to replace the departed Avery Bradley? Things get even trickier with the bench. Are new faces ready to contribute? Stevens joked about needing to learn all his new players' names before training camp and admitted the first three months of the season could very well serve as a test kitchen in which to figure out how all these parts fit together, especially after the NBA shortened the preseason this year to better space out the regular season. Five of the 14 players on Boston's roster have never played an NBA game: rookies Tatum, Guerschon Yabusele (a 2016 first-round pick stashed overseas and in the G-League last season), Daniel Theis (a German import on a minimum contract), Semi Ojeleye (a 2017 second-round pick with NBA-ready strength) and Abdel Nader (a 2016 second-round pick who was the G-League Rookie of the Year while stashed domestically last season). During Boston's expedited climb to contender status, Stevens didn't lean all that heavily on rookies. Yes, last season he did his best to give Brown steady minutes but also had a quick hook for him early in the year as Brown learned his defensive responsibilities. Stevens might not have that luxury this year. Brown could be a starter if the Celtics like his versatility on the wing alongside Hayward. Tatum showcased NBA-ready offensive skills during summer league and will get an opportunity to earn immediate minutes with a Boston second unit that must find ways to make up for the loss of players like Kelly Olynyk (as maddening as he was at times to Celtics fans, Olynyk helped Boston's second unit offense). Essentially, if Stevens goes more than eight players deep on a given night, a rookie is likely going to contribute. Considering that Stevens often rolls out 11 or 12 players during regular-season games, there will be an opportunity for young players to get their feet wet. Who fills the final roster spot? The Celtics had Thomas Robinson in for a visit at the start of the week and there's an obvious need for rebounding, particularly after 7-footer Ante Zizic was moved in the Irving swap. Boston need not rush to fill that final roster spot and we'll keep hearing rumblings about veteran bigs like Andrew Bogut. The Celtics weren't a particularly good rebounding team last season and ranked 27th in both defensive and total rebound rate. A more consistent defensive effort could alleviate Boston's woes on the glass and Stevens would prefer to have a bunch of switch-happy perimeter players than a plodding big man snagging rebounds. 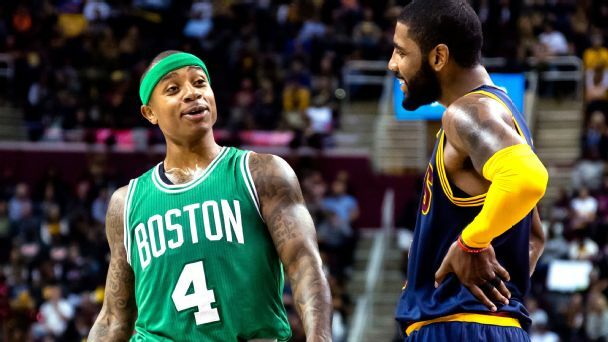 Three months after meeting in the conference finals, the Cavs and Celtics completed an unprecedented swap of All-Star guards, sending Kyrie Irving to Boston and Isaiah Thomas to Cleveland. • Forsberg: Boston better after trade? • Vote: Which team won the trade? Are more moves to come? Considering Ainge has made 22 trades over the past four years, it's a matter of when, not if, the next deal will come. Despite giving up maybe their best remaining pick in the Irving deal -- the 2018 Nets first-rounder -- the Celtics still have as many as five first-round picks in the next two drafts. That could include a top-5 pick from the Lakers in June and an intriguing Grizzlies pick a little further out. Those picks could be used to add complementary parts and offset the relative youth of the current roster. Or there's always the prospect of a much larger deal down the road. The name that will not go away moving forward is Anthony Davis. Maybe it's the volatility in New Orleans, but he's the superstar who appears most likely to shake free. Much like with the Irving deal, the Celtics will be ready to pounce if another star becomes available -- Davis or otherwise. Whether they can truly make a team consider another seismic move might hinge on the development of Boston's youngest players. If Brown and Tatum develop into star-caliber talent then Boston has the young pieces that could facilitate a deal. The preference might be for those players to blossom on their ultra-affordable contracts and maybe serve as the future Big Three alongside someone like Irving. The bottom line is that the Celtics have put themselves in a position where they can go get two superstars in one summer with hopes of immediately being more competitive and still stay in the game for elite players further down the road. As daunting of a task as Stevens faces now integrating all the new faces, when those players are some of the top talent in the league, it's a lot easier to figure out how it all works.